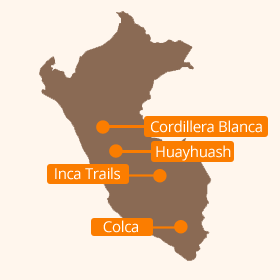 Many people's first thought is to trek the Inca Trail to Machu Picchu, and it's certainly a worthy addition to any holiday in Peru, but for our money the best hiking in Peru is to be found a little further north, in the Cordillera Blanca and Cordillera Huayhuash near Huaraz, which has arguably the best high altitude trekking anywhere in the world. 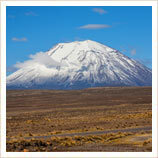 Further south, the majestic Colca Canyon offers some superb acclimatisation treks, and also the chance for even novices to climb a 6000m mountain, in the beautiful El Misti volcano. 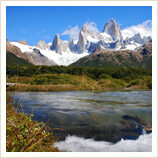 Contact us to start planning your trek! 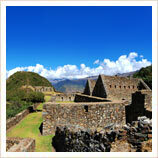 Sometimes known as Machu Picchu's sister, the little-known Inca site of Choquequirao is incredibly impressive and the only Inca site to compare to Machu Picchu itself. This excellent trek takes you through a lower, largely semi-tropical environment so you don't quite as much acclimatisation time, although it can be extended to continue on to Machu Picchu as well. 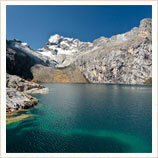 Peru's Central Andes around Huaraz, including the Cordillera Blanca and Cordillera Huayhuash, offer the chance for trekking in a pristine Alpine-style environment, with colossal snow-capped peaks and beautiful glacial lakes, interspersed with glorious wildflower meadows and babbling streams. 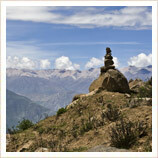 It's no exaggeration to say it's some of the best high-altitude trekking in the world. Setting out from the trekking centre of Huaraz in Central Peru, this superb 4-day trek takes you through some of the best of Peru's alpine scenery, including the high peaks like Huascaran and beautiful glacial lakes such as Lake Llanaganuco. 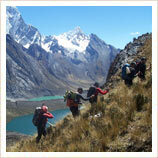 This lovely day trek is a great way to acclimatise for any of the longer treks in the Huaraz area. it offers a fairly steep ascent without extreme altitude, and it's hard to beat the views from the banks of the crater lake of Churup as you sit down for a well-earned picnic lunch! Offering possibly the best high-altitude trekking in the world, the Cordillera Huayhuash mountain range is a Mecca for dedicated trekkers. The enormous snow-capped peaks, the stunning series of glacial lakes and the sheer remoteness of this amazing environment have to be experienced to be believed. If you'd like to experience Colca Canyon in a slightly more adventurous way than the usual minibus tour, then this 3-day trek (really with only 2 days of trekking) will allow you to explore some more of Colca's fantastic landscapes and see more of the giant Andean condors who make the Canyon their home.